Dr. Ph. Martin's Bombay India Inks offer powerful color in a convenient dropper-stopper glass bottle. 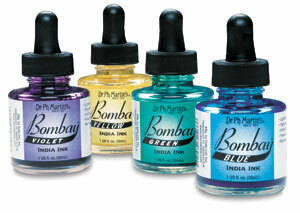 These highly pigmented India inks not only remain lightfast and permanent, but are also totally waterproof when dry. They adhere to nearly all surfaces. ® Dr. Ph. Martin's is a registered trademark. Bombay is a trademark.